It is October 1990 and I am standing 150 yards from the "sarcophagus" ─ the concrete and steel structure hastily erected to entomb the remains of the exploded reactor. The dosimeter is frantically beeping, but the threat seems unreal ─ just as unreal as it must have seemed to a group of people fishing in a nearby canal when the blast occurred; their view of the accident was obscured by the other units, so they just kept watching their lines. Only later did they pay the price for that night. 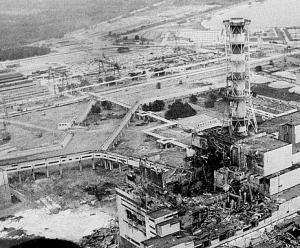 It has been 4 years since the fourth unit of the Chernobyl Nuclear Power Plant vomited a mixture of uranium, steel and concrete in a plume that narrowly missed Pripyat, a satellite town constructed specially to service the facility. Since then the double rows of poplars dividing Pripyat's main drag have swung themselves skyward ─ tall and handsome ─ while at their feet the grass longs silently for a mower that will never come. If you don't look too closely at the shabbily constructed buildings, the impression is one of an American college campus. The laundry on the balconies was finally taken down ─ two years after the evacuation ─ and only a few broken windows hint at the pillaged contents of the apartments, looted by the very police sent to guard them. The ferris wheel's bright colors are only slightly faded, and the flick of a switch is all that is needed to send it lurching once more into a ghostly, creaking vortex. Completed just before the accident, the stadium waits for the soccer crowds that will never come. Everything waits. 13,000 apartments wait for 13,000 families; schools and nurseries wait for the tumult of childhood (Pripyat was a "young" town" ─ with many children); and, inside its concrete tomb, Unit 4 waits for 100,000 years to pass, or perhaps 500,000. By comparison the pharaoh's pyramids will be ephemeral creations indeed. But already the integrity of the structure is failing, and the entire unit will have either to be encased in an outer building or physically removed and buried at some as yet undetermined site. Physically untouched by the blast, the control room of Unit 4 is a chaos of disassembled panels, dead gauges, unlit dials, dust and darkness silently pierced by billions of sub-atomic particles. Down the corridor, in Units 1, 2 and 3, it's business as usual; just yards away from the disaster site electricity is still being produced to heat homes and power factories. Located in a building contiguous with the remains of Unit 4, Unit 3 had not even been started up when the disaster occurred. Men were issued wheelbarrows and sent up on the roof to collect the scattered live fuel with shovels! Now white-coated priests attend iconostases of dials and switches in the three operating units, trucks spray the 30-kilometer isolation zone with a special compound to prevent the dust from rising, and a young woman strolls through the ghost town like a being from another planet. Salaries were doubled for those who agreed to stay on, but even so 95% chose to leave. The Deputy Director of the station gives us an upbeat briefing on the current state of affairs while, in a lesson in how not to handle community relations, an elected government official is forced to wait for us for three hours without even getting permission to enter the station. These are days of Ukrainian autonomy, perhaps even secession from the Union, and Chernobyl is perceived by many as a Pandora's box foisted on them by their Russian brothers. Across the Ukrainian border lies Byelorussia, which itself took the brunt of the radiation, even though it has no reactors. Not surprisingly, government functionaries are less than eager to share medical data. Government and Communist Party officials are running scared at all levels, not just over nuclear problems. The treasury is running its printing presses overtime, while prices in the stores are maintained at more or less stable levels. The result is an all-consuming black market for government goods and services, so the stable prices in the empty stores rarely leave the realm of the hypothetical. In Moscow one grocery store offers only three items for sale ─ sausage, plum jam, and mineral water. In a Kiev store the selection was soft drinks, sausage, sugar (rationed), and juice. Government newspapers and television programs alternate between threatening the people with hunger if they fail to help bring in the harvest and denying rumors that there will be starvation. When for a while even bread disappears from Moscow stores, a government newspaper dismisses the problem as "exaggerated." Society is like a lump of dough squeezed by a tightly clenched fist. From between the fingers issue crime, superstition and astrology, faith healers, fringe religious sects, secessionist movements, fear, anger, and a sense of hopelessness and frustration. In the hotel restaurant, as the third waitress that morning tells me she wants to emigrate, a popular tune blares for the umpteenth time from the loudspeaker: "American boy, take me away.... Farewell, Moscow." At the press conference we are asked if nuclear power would still be produced in the United States if a Chernobyl-like catastrophe were to occur in Washington, D. C. The Nuclear Regulatory Commission representative declines to speculate. The medical consequences of the situation are unclear, but most people believe they are being lied to. The train conductor tells us she has a breast tumor the size of a chicken egg and claims that 90% of the women have cancer. Such rumors are common. At a political rally I am given as a keepsake the registration card of Deputy 112 of the Ukrainian Green party, on the reverse is a stylized depiction of the reactor and the words "A Ukraine Without Chernobyls!" After the rally a man begs me to help his 7-year old son, who has already received 50 blood transfusions. 600,000 people were involved in the clean-up of Chernobyl, and untold numbers have received massive radiation doses. Treatment was and is available for the "heroes of Chernobyl," one of whom described how he attempted to save the situation working under a stream of radioactive coolant from the primary circuit. Another described the eery view of the station in the early morning hours following the accident: instead of a massive building there was a mass of rubble issuing its own glowing sunrise. For these few heroes there is treatment of sorts and even some special privileges, such as food and housing. Others, like the firemen who thought they were simply putting out a fire, are buried in a cluster at a Moscow cemetery. The core of a nuclear reactor is in a constantly fluctuating state. What caused the Chernobyl accident? How had a simple test gotten out of hand and led to such a disaster? Like Chernobyl, the Khmelnitsky Atomic Station is located in the Ukraine. One of the safety systems is to be tested in our presence. In the United States a similar test could be conducted only during "shut-down," but this is an actively functioning reactor. The Control Room, virtually identical to that of Chernobyl's Unit 4 before the accident, is lined with gauges, switches, color computer monitors. All personnel ─ American observers included ─ wear white gowns, caps, and special footwear. Control Room operators occupy their posts, and a serious of commands ricochet through the room. Eyes intently watch gauge readings, computer monitors. Finally the switch is pulled, intentionally disrupting the normal functioning of the reactor. Will the emergency system be activated? The test is supposed to be routine.... A loud, harsh siren drowns out all voices, and the gauges and computer monitors indicate that the safety system has been turned on ─ as planned. The relief in the room is as palpable as was the tenseness just a few moments earlier. The presence of observers obviously has not been a plus in the eyes of the personnel; now that that obligation has been satisfied, the senior operator asks us to leave. As we shuffle out, we are all thinking of the initial stages of the Chernobyl test that led to the accident. John Glad is the former Director of the Kennan Institute for Advanced Russian Studies in the Woodrow Wilson International Center for Scholars, in Washington, D.C.
Do you have any memories of historical events that happened in Russia? Please send them to us via us@rbth.com!